Affordable Classes for Women of All Ages! Magical Map-Fold Books: Saturday, April 6, 10 to 1: You’ll LOVE these awesome, intricate books! Don’t be intimidated–they’re easy and FUN! I’ll provide colorful papers and card stock plus easy, step-by-step, hands-on instruction. $20–all supplies included. Denim Pocket Books: Tuesday, April 16, 10 to 1: Our monthly gathering of creative mavens who like to talk about our lives while we make cool stuff. Come embellish and enchant a denim pocket and make a small handmade book to slip inside. Bring a snack to share if you’d like. $20–all supplies included. Crazy Cool Flare Book: Tuesday, April 23, 10 to 12:30: I love re-purposing metal altoid tins! These awesome books flare out of a painted and embellished tin! Lots of fun and easy little treasures to give as gifts or keep for yourself. $20–all supplies included. Please note: May classes will include a “Fun With Judy” day and, hopefully, another awesome bookmaking class with Teresa! PLUS, a new series: Creative Way/Artist’s Path. Stay tuned for details! PLEASE NOTE THERE IS NO MAIL DELIVERY TO THE COTTAGE! P. S. I do creative classes in individual homes, churches, community centers, and clubs–call me for ideas and rates! Space Is Limited, Classes Fill Fast–Pre-registration is required! Call Kaitlin at: 622-6161 or Email: paloma@dakotacom.net to register for classes! Working through some issues? At a critical juncture in our life? Wanting to live a happier, less stressful, more creative life? I offer a specialized personal counseling and empowerment program to help women who are ready to leap into a happy, satisfying, and more creative life. Look for a small courtyard on the Southeast corner of Main & University. 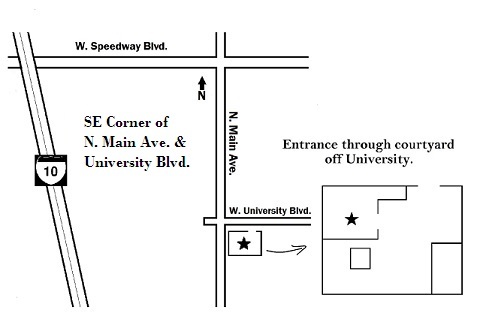 University is North of St. Mary’s Blvd. and South of Speedway off Main Ave. Main is the first major street West of Stone and East of Interstate 10. Free parking on University, then walk through gate on white adobe wall directly across from the Holy Family Catholic Church. My studio is on the right side, to the left of the huge tamarisk tree. PLEASE NOTE: THERE IS NO MAIL DELIVERY TO THE COTTAGE! Come Play, Make New Friends And Unleash Your Creativity! I love offering a safe, nourishing, peaceful place for women to come play! Join us soon for a chance to be creative, make friends, and have some FUN!!! No art making experience necessary, small, intimate, inexpensive classes with lots of encouragement and hands-on instruction, and a beautiful, cozy setting…come join the fun! Getting ready to create my class offerings for November…lots of very cool ideas for fun days of creative play–come on over to the Cottage to enjoy the cool Autumn weather, meet new friends, and have some FUN! I’m waiting to see your listings for November, Kaitlin, and hope I can work out the time to come and play with you — and learn a few subversive things! Hi Tamas~November schedule finally up–WHERE does the time go! Come play! What does your January Word Weavers class schedule look like? Can you email me the info? thanks! Should have my January schedule out by mid December…Happy Holidays! I’ve taken many classes at Kaitlin’s Creative Cottage and I recommend it to all of my friends. The projects are pure fun to work on, and I always find I learn a little more about myself in the process. Kaitlin has helped me open new doors to creativity and enjoyment. Trying a new project is easy at Kaitlin’s–she has a wealth of materials and offers as much or as little guidance as you wish. Thanks Merrill~Love having you in my classes because you always bring such focus and calm to my creative dervish energy! See you again soon…for more FUN! Love, love ,love going to Kaitlin’s Creative Cottage to learn some art techniques & fun inspirations. Kaitlin always has many creative ideas to look inside and find something interesting to create. She definitely has a way to make the process expressive and even therapeutic(like gardening, only better), inspiring art and self-awareness, all in the name of fun! Thank you for providing the space of the art cottage, Kaitlin. You are an amazing creativity ally. Lucy is a relatively new transplant from Texas and the magical Fates brought her into my life to bring me joy and new friendship…Lucy’s light & art shines! I am really enjoying the current class i’m taking–“Get Out of the Box.” But then, I’ve really enjoyed EVERY class I’ve taken at Kaitlin’s. I learn a lot, and I get to hang out with other creative souls. Theresa–you rock! Your creativity always inspires and delights me! Thank you for adding your grace, humor, and caring heart to the circle of friends at The Cottage! Could you schedule some Zentangle classes? They are so much fun! Love to–I’ll try for one soon! Thanks for the update Kaitlin! I can’t wait to get back to your fabulous Cottage of Wonderment! I am still traveling but will return to Tucson soon. Don’t forget me!